Teeth aren’t exactly bones, but they’re made up of similar tissues and are subject to the same problems bones may have. Vitamin D deficiency, including the conditions of rickets and osteomalacia, also can affect teeth. The baby, or primary, teeth begin to erupt from the gums at six months of age, which any parent knows is a painful time called teething. Primary teeth begin to develop between the sixth and eighth weeks of pregnancy. Permanent teeth form in the twentieth week of pregnancy. These times are critical, and the teeth may not develop if they don’t start by then. If a mom’s vitamin D and calcium levels are deficient when this development is taking place, the teeth don’t form normally. A tooth consists of a top part called a crown, made of enamel. Enamel is made up of calcium phosphate and is the hardest substance in the body. Under the crown is supporting dentin, which is mineralized tissue that isn’t as hard as the enamel. 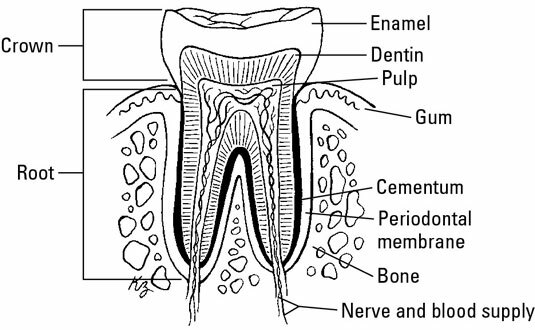 Within the dentin is the pulp of the tooth, which contains the nerves and blood vessels for the tooth. The tooth continues down into its bony support of the jaw and skull as one or more roots, which are covered by cementum. Cementum is another mineralized tissue that is softer than dentin or enamel. Cementum permits the tooth to attach strongly to the bone. Where the crown of the tooth meets its supporting bone, it’s surrounded by soft tissue called gingiva, or gums. Delayed formation: The baby teeth may not erupt until after one year. When they erupt, they may be smaller than normal. Periodontal disease: Periodontal disease can affect many different parts of the tooth, the bone, the cementum, or the gingiva. All of these weaken the anchoring of the teeth into bone. In the absence of sufficient vitamin D, the bone that forms in the jaw or skull isn’t sufficiently mineralized. Periodontal disease is also commonly caused by infection of the gums. When a gum infection occurs and the gingiva become inflamed, normal chewing or pressure on the gums makes them bleed easily. This condition is called gingivitis. Calcitriol helps regulate the immune system and protect against inflammation so some have suggested that low vitamin D status increases periodontal disease by increasing gingivitis. Regardless of the cause, when the teeth become loose in the mouth they may fall out. Dental caries: Dental caries, or cavities, are holes in the enamel of the tooth and can also result from inadequate vitamin D status. Because the teeth don’t mineralize sufficiently in rickets caused by low vitamin D status, this may increase a person’s chances of getting cavities. In the absence of vitamin D, infection is established on the tooth, leading to further loss of enamel and cavitation (holes in the teeth). The caries can involve the enamel, the dentin, or the cementum. Pain occurs when the cavity reaches the dentin, which is connected to the nerves in the root of the tooth. Osteomalacia, a severe vitamin D deficiency that develops after the bones have been formed (in adults), can result in all these abnormalities as well. The teeth are painful, deformed, and subject to increased cavities and periodontal disease. They may be lost early.